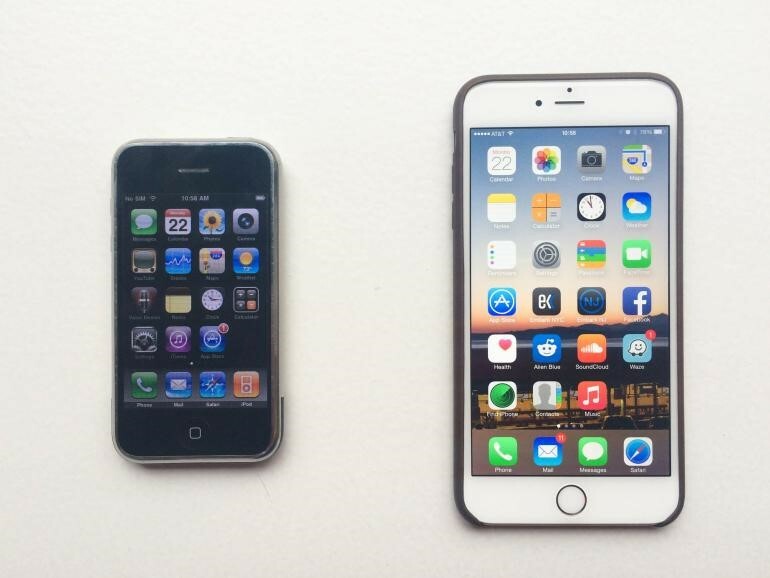 From the original iPhone to the iPhone 7, we’ve come a long way. January 9, 2007 is a day that has forever changed the technology industry. While I was alive and in kindergarten, like most, I don’t personally remember that day. The day itself wasn’t dramatic like 9/11, but without it, we certainly wouldn’t be where we are today. That was the day of Steve Job’s keynote address announcing the iPhone. Before 2007, everyone was using either flip phones or phones with ridiculously small keypads like the Blackberry released in 2002. iPhone would change that. The first iPhone model I remember was the iPhone 3 then 4 and 4s up to today’s iPhone 7. However, many, like me, forget the original iPhone model (there was no iPhone 2). While one couldn’t say the phone itself is not recognizable, it was lacking in many features considered standard today. First off, it was small. The screen size was 3.5 inches, even smaller than the SE. Second, it was slow. It had only 128 metabytes of ram. Today’s Apple Watch has 512 metabytes, while the iPhone 7 has 2 gigabytes, while the 7 plus has 3. Needless to say, we’ve come a long way. Also, our fast 4g and LTE weren’t around yet. In fact, 3g wouldn’t come out until 2008. Instead, people had to rely on the slow 2g speeds. The ability to change your wallpaper, bluetooth, a front camera, and touch id are all standard features in iPhones and many smartphones today. The original iPhone had none of these features. Probably most basic to its identity today, the original iPhone lacked an app store. Steve Jobs wanted no third party created apps. Fortunately for us, that’s not how it played out. If you like Verizon, Sprint, or T-Mobile, the original iPhone is not for you. AT&T was the only provider. In fact, you could only buy the iPhone by signing a 2 year contract with AT&T. Then, there’s price. Lately, many have complained that newer iPhones aren’t the $199 and $299 they used to be and are instead around $650 or higher. While iPhone 3 and 4 were both much more reasonably priced, the original iPhone was not. Adjusted for inflation, the 8 gigabyte cost $687 (then $599), the other 4 gigabyte model cost less. The reason many of us only remember the iPhone 3 and beyond was the price. Only the more elite could afford it, and there weren’t payment plans like today. Apple lowered the price a few months later to $399 and later dropped the 4 gigabyte model for a 16 gigabyte model. By the iPhone 3, Apple dropped the price another $200. Today, the 16 gigabyte model is the least amount of storage. There are also 64 and 128 gigabyte options. It’s amazing to think of what we take for granted on the iPhone. It’s also hard to imagine exactly what life would be like without the iPhone. Certainly phones would be somewhat different and more advanced. Social media really began to grow around the release of the first iPhones and truly smart phones. Without Facebook on our phones, would it be as popular? Without really good phone cameras, would Instagram exist? Without faster data brought on by the demand of smartphone users, would we rely on our smartphones for information and communication? We’ll never really know, but it’s no speculating that Apple changed the ballgame of technology with the iPod and then the iPhone. Since 2007, they’ve added more revolutionary products such as the iPad, Apple TV, and most recently Apple Watch. It’s been 10 years and we’ve come so far, I can’t even fathom what technology will look like in 2027. Without Apple, it’s hard to say where our society would be. Some would say less technology would be better and bring fewer distractions, while others like the connectivity the technological world of today offers. No matter your opinion, that cold Tuesday in 10 years ago was certainly ground breaking and life changing. For those of us alive on January 9, 2007, that day was any ordinary day. For generations to come, that day will be in history books as the day our world was forever changed by technology.